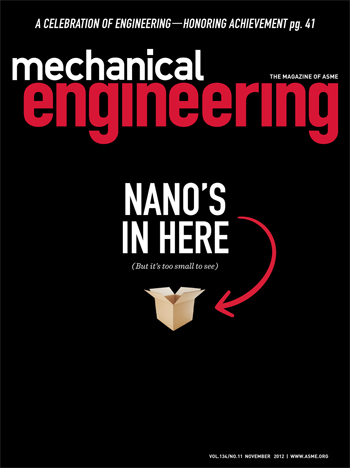 My November column in Mechanical Engineering magazine. When those we love are ill there is nothing we want more than a magic pill to cure what ails them. We’ve all known the feeling, whether it’s to cure a young child or an aging parent. Such a pill—at least for some of the deadliest of illnesses—is not yet available, but many in the biomedical field are working hand-in-hand with engineers to turn this science fiction notion into reality. And they’re getting closer. When they get there, nanotechnology will have achieved its ultimate promise. Until then, the chapters in the story of nanotechnology are still being written. In this month’s cover story, “Nanotech Unbound,” we see some of the progress—which is by no means trivial. If our story is the first you hear of the progress being made, blame the engineers. They and their colleagues working on nanotech are the unsung heroes who work without much fanfare and without many headlines making progress in the labs. But that should come as little surprise. Engineers are typically not ones to pat themselves on the back when they achieve a milestone. This month, we’re taking the liberty of doing that for them. We’re proud to praise some of the engineers who are being recognized by ASME for having made great strides in the profession. Formally, their awards will be celebrated this month during the ASME 2012 International Mechanical Engineering Congress and Exposition in Houston. These awards recipients are not the only ones who have achieved success in their profession, but it is they whose work has come to light. Among the recipients this year, are eleven whose work deserves special recognition. They are: Jan D. Achenbach, currently Distinguished McCormick School Professor Emeritus in Service, who founded the Center for Quality Engineering and Failure Prevention at Northwestern University; Yildiz Bayazitoglu for outstanding contributions in transforming fundamental research to engineering applications such as photo-thermal cancer therapy, space waste-heat recovery, and nano-composite materials processing; Zdeněk P. Bažant for his seminal work on solid mechanics and structures; Jane H. Davidson for shaping solar energy research and policies at the national and international level; Vijay K. Dhir for his leadership at UCLA engineering, which has become a hub for interdisciplinary research and education; Goshi Hosono for tackling the Tokyo Electric Power Co.’s Fukushima-Daiichi Nuclear Power Station accident since its outset in March 2011, initially as special advisor to Prime Minister Naoto Kan, and then by rapidly increasing personal involvement and political appointments; Yogesh Jaluria for his work on flows, including those related to environmental phenomena and building fires; Mohinder L. Nayyar for his role as a globally recognized specialist in the areas of piping, valves, materials, and codes and standards; Anita Rebarachak for continuous dedication and service to ASME and remarkable technical and professional achievements and for mentoring students and early career engineers; Edith Stern for developing novel applications of new technologies, which have yielded 110 U.S. patents; Subra Suresh for his work as the director of the National Science Foundation, a $7 billion federal agency. As we continue to strive for the Fountain of Youth in our medicine cabinet, there are those whose life’s work it is to improve our world so that we can live long, stay healthy, and be happy.